The FCC tentatively plans to consider at its April 12 meeting a draft public notice that would propose application and bidding procedures for an incentive auction (Auction 103) of upper microwave flexible use service (UMFUS) licenses in the upper 37 gigahertz (37.6-38.6 GHz), 39 GHz (38.6-40 GHz), and 47 GHz (47.2-48.2 GHz) bands. The FCC plans to commence the sale later this year. The Commission released its tentative agenda for the meeting today, along with drafts of the six items to be considered (TR Daily, March 21). The meeting is scheduled to start at 10:30 a.m. The FCC would auction the spectrum via 100 megahertz blocks that would be licensed by partial economic areas (PEAs). The public notice in AU docket 19-59 would propose bidding procedures for the clock and assignment phases of the sale. The FCC is proposing bidding credits of up to $25 million for small businesses and $10 million for rural service providers. Also tentatively scheduled for consideration at the April 12 meeting is a draft fifth report and order in GN docket 14-177 “that would allow Fixed-Satellite Service earth stations to be individually licensed to transmit in the 50 GHz band and would establish a process for the Department of Defense to operate on a shared basis in the Upper 37 GHz band in limited circumstances,” the tentative agenda notes. The fifth report and order follows up on a third further notice of proposed rulemaking adopted last summer (TR Daily, June 7, 2018). Also tentatively on tap for the next meeting is a notice of proposed rulemaking in WT docket 19-71 that would propose the modernization of the FCC’s regulations governing over-the-air-reception devices (OTARD) to make it easier to deploy fixed wireless infrastructure. “The Commission’s rules prohibit State, local, or private laws, regulations, or restrictions that impair the ability of antenna users to use over-the-air-reception devices (OTARD),” a fact sheet notes. “The rule covers antennas used for fixed wireless signals, provided that: (1) the antennas are small (less than one meter in diameter or diagonal measurement); (2) the property on which the antennas are located is within the exclusive use or control of the user (if the user has an ownership or leasehold interest in property); and (3) the antenna transmits and receives fixed wireless signals for the use of those who control the premises on/in which the antenna is located. The OTARD rule does not currently apply to antennas operating primarily as hub or relay antennas used to transmit signals to and/or receive signals from multiple customer locations. “We seek comment on the extent to which extending the OTARD rule to fixed wireless hub and relay antennas would spur infrastructure deployment, including the deployment of mesh networks in urban, suburban, and rural areas. To what extent would extending the rule create more siting opportunities for fixed wireless service providers? What effect would adoption of the proposed rule have on infrastructure deployment in rural, Tribal, and other underserved areas? What effect would it have on infrastructure deployment by small providers?” the draft NPRM asks. “Do fixed wireless service providers face a competitive disadvantage with respect to the deployment of these network facilities compared with other types of providers, such as carriers whose deployments are subject to the provisions of Section 253 of the Act or mobile operators whose deployments are subject to the provisions of Section 332? What are these competitive disadvantages?” it also asks. Also on the tentative agenda is a draft report and order in WC docket 10-90 that would eliminate the voice service “rate floor,” or minimum monthly subscriber charge by carriers that receive universal service high-cost support, which has been frozen at $18 since 2017. The freeze is scheduled to expire July 1, and increases in the rate floor, which is the urban average monthly rate determined by the FCC’s urban rate survey, mean that the rate floor would increase to $26.98 on July 1 absent FCC action (TR Daily, Dec. 21, 2018). “If a carrier chooses to charge its customers less than the rate floor amount for voice service, the difference between the amount charged and the rate floor is deducted from the amount of support that carrier receives through the Universal Service Fund (Fund). The practical effect of this rule is to increase the telephone rates of rural subscribers, who are often older Americans on fixed incomes, lower-income Americans, and individuals living on Tribal lands. These Americans are some of those least able to afford the needless rate increases caused by the rate floor,” according to the draft report and order. “After a thorough review of the record evidence, we now eliminate the rate floor and its accompanying reporting obligations. Doing so ends the de facto federal mandate to needlessly increase telephone service rates for many rural Americans above those the market would otherwise produce, and avoids a further increase from $18 to $26.98 on July 1, 2019 — an increase that would have reduced the affordability of telephone service for rural Americans, including the elderly, low-income individuals, veterans, and their families. As a result, we ensure that rural consumers continue to receive quality services at just, reasonable, and affordable rates, while also ensuring that rural carriers continue to receive the predictable and sufficient universal service support needed to serve high-cost areas,” the draft order says. The tentative agenda also includes a draft memorandum opinion and order in WC docket 18-141 that would grant, in part, a petition for forbearance filed by the U.S. Telecom Association last year (TR Daily, May 4, 2018). Specifically, it would forbear from enforcing “the burdensome requirement that independent rate-of-return carriers maintain a separate affiliate to provide in-region long-distance service”; “unnecessary nondiscriminatory provisioning interval requirements, namely Section 272(e)(1) of the [Communications] Act and related special access performance metric reporting obligations”; and “the requirement in Section 271(c) of the Act that BOCs [Bell operating companies] provide nondiscriminatory access to poles, ducts, conduits, and rights-of-way because this requirement is redundant of the obligations set forth in Section 224 of the Act,” according to a fact sheet released with the draft item. USTelecom had also sought forbearance from unbundling and resale mandates imposed on incumbent local exchange carriers (LECs) in section 251(c)(3) and 251(c)(4) of the Act and associated obligations in sections 251 and 252, “a request that we do not address at this time,” according to the draft opinion and order. Section 10 of the Act, which was added by the Telecommunications Act of 1996, grants the FCC forbearance authority, although that authority is limited with respect to section 251(c) and section 271. 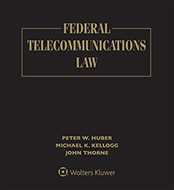 “Except as provided in section 251(f) [which deals with exemptions from incumbent local exchange carrier unbundling, interconnection, and collocation requirements for rural ILECs], the Commission may not forbear from applying the requirements of section 251(c) or 271 under subsection (a) of this section until it determines that those requirements have been fully implemented,” section 10 says. Section 10 also states that if the FCC does not act on a petition for forbearance within one year, it will be deemed granted. The Commission can grant itself one three-month extension for consideration before the deemed-granted provision would take effect. In an order in WC docket 18-141, the FCC’s Wireline Competition Bureau recently granted the three-month extension, until Aug. 2, of the deemed-granted date for the USTelecom petition (TR Daily, Feb. 14). In a footnote, the draft order says, “This order does not address, and should not be construed as prejudging, USTelecom’s request for forbearance from obligations arising from sections 251(c)(3) and (4) of the Act relating to unbundled network elements and resale.” It notes that the Aug. 2 deemed-granted date applies to those pending aspects of the USTelecom petition.